Lake Bonneville was the precursor of the Great Salt Lake. The shorelines of this ancient lake can be seen on the higher slopes of the Wasatch Mountains, more than 984 feet above the present level of the Great Salt Lake. 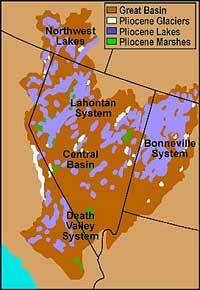 Before the catastrophic Bonneville flood, Lake Bonneville covered an area of more than 19,691 square miles. Approximately 15,000 years ago Lake Bonneville, a late Pleistocene lake, suddenly discharged an immense volume of water to the north. This flood is thought to be caused by capture of the Bear River which greatly increased the supply of water to the Bonneville Basin. These flood waters flowed over Red Rock Pass in southeastern Idaho and continued westward across the Snake River Plain generally following the path of the present Snake River. Although this enormous flood was first described in the literature by Gilbert in 1878, Harold Malde (1968) of the U.S. Geological Survey published the first detailed account of the effects of the flood on the Snake River Plain. The name "Bonneville Flood" first appeared in the literature in 1965 (Richmond and others, 1965). Large rounded boulders of basalt characterize many deposits left by the flood along the Snake River Plain. H. A. Powers, who recognized that these boulders were of catastrophic origin, and Malde applied the name of Melon Gravel to the boulder deposits (Malde and Powers, 1962). They were inspired to use this term after observing a road sign in 1955 that called the boulders "petrified watermelons." The release of water from Lake Bonneville was apparently initiated by sudden erosion of unconsolidated material on the northern shoreline near Red Rock Pass. Although Malde (1968) originally proposed a flood date of approximately 30,000 years ago, he has subsequently revised this age to 15,000 years ago. Malde (1968) estimated that the probable peak discharge of the flood was approximately one-third cubic miles per hour (15 million cubic feet per second). This is to be compared with a maximum historic discharge in the upper Snake River of 72,000 cfs at Idaho Falls in June of 1894. The total flood volume is believed to be about 380 cubic miles. The catastrophic flood from glacial Lake Missoula, which swept across northern Idaho, Washington and Oregon, caused far more disturbance than did the Bonneville Flood. When the ice dam failed that contained impounded Lake Missoula, 500 cubic miles of water were suddenly released. This flood escaped at a peak discharge estimated to be 9.5 cubic miles per hour. This rate exceeds that of the Bonneville Flood by 30 times. Malde (1968) suggested that most of the important despositional and erosional features of the Bonneville Flood were developed in a few days; however, the Snake River sustained a high rate of flow for more than a year. The Melon Gravels deposited by the flood average three feet in diameter, but some well-rounded boulders range up to 10 feet in diameter. These boulders are composed almost entirely of basalt broken from nearby basalt flows. Only several miles of transportation by the flood was sufficient to round the boulders after which they were dumped in unsorted deposits up to 300 feet thick. Melon gravel bars are as much as one mile wide by 1.5 miles long. Many channels were cut by flood waters near the margin of the main channel of the Snake River. These marginal channels were caused by gravel filling the main channel so that the water was diverted along a new channel. The channels, which measure several miles long and 150 feet deep, were abandoned when the flood subsided. Bretz (1923) first used the term "scabland" in reference to the eroded surface of basalt flows scoured by the Spokane Flood. This erosion was caused by glacial floods removing soil and rock from the surface. Scabland erosional features include coulees, dry falls (alcoves) and anastomosing channels distributed in such a manner as to cause a bizarre landscape. The area affected by the flood can readily be established by the presence of scabland. Gigantic dry falls and potholes range up to 120 feet in depth. Minor features on the basalt bedrock exposed to the flood include polished and fluted surfaces that indicate the direction of the flow. Blue Lakes alcove, Devils Washbowl and Devils Corral are alcoves along the north canyon rim of the Snake River several miles north of Twin Falls. They were caused by flow from the Rupert channel along a 10-mile-wide spillway. The basalt was thought to have eroded these alcoves by cavitation rather than by cascading water alone. These alcoves formed tiered sets of abandoned plunge pools by stripping off basalt layers 25 to 50 feet thick so as to cause a stair-cased profile. From 20,000 to 16,000 years B. P. (before present), Lake Bonneville rose gradually until it reached the level of an alluvial spillway. The alluvial spillway suddenly collapsed and the water level dropped about 350 feet from the release of about 380 cubic miles of water. The flood is believed to have occurred between 15,000 and 14,000 years ago with the best estimate at about 14,300 years ago (Currey and others, 1983). The Bonneville flood followed the Snake River Canyon to the Columbia River in Oregon. At several localities such as Tammany Bar near Lewiston, a tributary of the Snake River, deposits of the gigantic floods merged. Deposits from the Spokane Flood were laid by backflood up the Snake River from the easternmost channel of the scabland. The Bonneville flood deposits were placed over about 20 Missoula backfloods or graded flood-laid beds and 21 more Missoula graded beds overlie the Bonneville-flood gravels. Therefore, the Bonneville flood occurred some time in the middle of the 2,000 to 2500 years period during which the 40 plus Missoula floods were released. This module includes exercises associated with the effects from the Bonneville Flood along the Western Snake River Plain. The Western Snake River Plain (WSNP) is a northwest trending structural basin that is bounded on both sides by high angle normal faults and filled by more than 4 km of sedimentary and volcanic deposits (Wood and Anderson, 1981). Volcanism of the WSNRP began approximately 14 million years ago with the extrusion of rhyolitic lava flows followed by the eruption of ash flow tuffs. The tremendously thick basalt deposits began approximately 12 million years ago from eruptions of shield volcanoes. Specific features and regions explored in this module include: boulder bar deposits along Walters Bar, scouring near Swan Falls Dam, potholes near Eden and boulder fields near Hagerman. Most of the deposits associated with the Bonneville Flood are easy to recognize in the field due to their immense size and sedimentary structures and the large percentage of basaltic clasts. Bonneville flood sediments can be separated into two genetically distinct classes; bed load and suspended-load (OConnor, 1993). Bed load, or tractive, sediments consist of clasts that were transported in continual contact with the river bed prior to deposition and suspended-loaded sediments contain clasts that were transported in the water column and supported by flow turbulence. Features that consist of bed load sediment are expansion bars, longitudinal bars, point bars, and pendant bars. Tractive sediments were deposited within the main flood water flow regime where water velocities were high. Expansion bars, one of the largest features visible, and the elongate and narrow longitudinal bars were deposited along the wider portions of the flood route. Expansion bars are visible in the Hagerman Valley and at Walters Bar and a typical example of a longitudinal bar is the Initial Point Bar. Other examples occur in the Hagerman Valley. Point bars, for example Swiss Valley Point Bar, were deposited along the insides of channel bends with surfaces that slope toward the main channel. Pendant bars are narrow and sharp crested and are formed from sediment accumulations behind a resistant protrusion in the flow regime. A typical example of a pendant bar can be seen adjacent to White Butte on Walters Bar. Suspended load features consist of eddy and slackwater deposits. Eddy deposits accumulated in areas of reduced flow velocities, near tributary mouths and in gaps within the canyon wall. In these regions recirculation of water occurs leaving behind finer grained - better sorted sediments that exhibit large scale cross-stratification and a variety of bed orientations resulting from the changing flow patterns. The well sorted gravel deposited in chaotic festoon cross stratification north of Walter Bar is an excellent example of one of these eddy deposits. 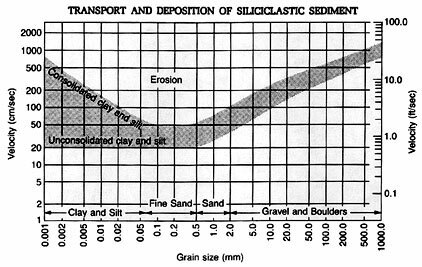 Slackwater deposits consist of fine laminated clay, silt and sand accumulating in low energy regimes such as basins and ponded areas along the flood route. The largest accumulations of the slackwater sediments are between Swan Falls and Farewell Bend.